UDM Downloads > Lottery Statistic Analyser! 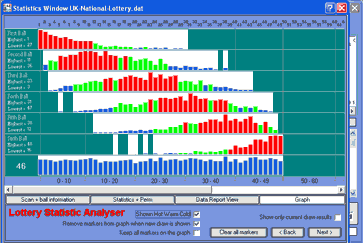 Lottery Statistic Analyzer is frequency analyst software that works by calculating thousands of equations on past draw results then with the findings creates a mathematical algorithm that's unique to your lottery draw results. LSA is compatible with any 5 to 7 number lottery with up to 99 numbers. LSA's features. On-line database updates Perms: 36 different pre made perm's, plus create your own feature. Hot Warm and cold number filtering, Calculate ball appearances and frequencies. Detailed statistical analyst reports of past results and more.